The Massachusetts senator, John Kerry is a step closer to becoming the Democratic challenger to President Bush. Kerry won the New Hampshire primary with 39% of the vote, nine days after winning the Iowa caucuses. The contest now moves up a gear when voters in seven states from Arizona to South Carolina have their say on 3 February. What is your reaction to the New Hampshire result? How do you see the race for the Democrat nomination going? Send us your comments. Bush - 4 more years! My taxes are going down! I predict that John Kerry will win the party nomination and Senator Edwards will be his running mate. Kerry will be president for eight years and Edwards a following eight. The world will return to normal, prosperity will return, and, the Bush family will leave politics forever. Flipping utopia I'd say. The one point everyone should be watching is the surge in the number of Democrat voters active in the primaries compared to four years ago. I am sure the Republican party is watching this ABB upswing very closely. Kucinich! Read his platform, and it should be obvious... everyone is babbling about Kerry, Dean, and Edwards while they know nothing about Kucinich. Dean is pretty much through but no one has really told him that yet. Clark has no political experience and that just will not fly with voters. Kerry won't win in the south, and Edwards won't win in the north. The result proves once again that the American people are smarter than the Media thinks. The Media was pushing Dean with all their strength, but the people voted for a more level headed and steady leader in Kerry. George Bush will have his hands full if Kerry wins the nomination but don't ever underestimate Dubya's ability to play election year politics. 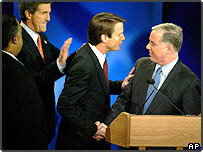 Only candidate that I believe is Howard Dean who has the spirit, intelligence and personality to stand against Bush's erratic policy. All other seems to be playing a game to win and telling people what they want to hear. Kerry who voted for a war is a hypocrite. I can't trust Edwards. I hope Dean wins to change this country's future for the better. As impressive as John Kerry's victories have been, his roots as a Massachusetts liberal will make it extremely difficult for him to win even a single state from the South, Rocky Mountains or Border regions of the United States. I believe John Edwards is the only Democrat who offers the combination of strong campaign skills and broad electoral appeal necessary to defeat George Bush in November. I understand Democrats' personal dislike of Bush, but to appeal to patriotic-minded swing voters who may rally round the War Leader, I'd advise them to hit Cheney, Rumsfeld, & co., who have gained less affinity with blue collar workers. They must hit at policies, not the Prez. With polls tied, it will be close, and they need to swing as many as they can. Kerry-Edwards ticket will send Cheny and his puppet packing. Oh, how we Americans long for an intelligent, spontaneous leader who represents the majority not just big business. John F Kerry is already a statesman. He has the stature and the experience to go all the way. I think he has the best chance of all candidates (including Bush) to win in November. However, Iowa and New Hampshire are small states and this race has only just begun. What annoys me is how much power the South has over the rest of the country. It's been that way for a while now. Unfortunately, that means we need a candidate who can appeal to the southern voters; the swing voters in particular. My guess is Edwards or Clark will come the closest. I'm an ABB (anybody but Bush) voter so it's all good to me. Annoyed by the "power of the South"? That's democracy, Dana! Blame the Founding Fathers for the Constitution, if you must. The count is done, and Kerry won. Dean isn't dead yet, but New Hampshire voters chose their neighbour from Massachusetts instead of their neighbour from Vermont. After Dean comes in third or fourth in South Carolina next week, the race will be Kerry vs. Edwards. None of the other candidates count any more. I like Edwards, he seems stable and honest. He's from a blue collar background and is more in touch with the typical American. We need someone that will bring back and retain American jobs in America and will have a strong healthcare reform package that is beneficial for the public. Regardless, every American needs to vote. Get out there and vote or don't complain! Anyone will do! I don't think the world will get any better if we are to have another four years of G.W. Bush. Three words, VOTE FOR CLARK! He has the best policies, well structured and much like another success story, the New Deal. Clark also has the characteristics to beat "President" George W. Bush in the 2004 Election. While I hope that Dean wins, just because I like a dynamic and honestly flawed candidate...I want to see someone who can rebuild our relationships with the rest of the world, which Bush has all but destroyed. I can't stand the way the US is viewed by the rest of the world. We aren't all gluttons who only care about ourselves. I'd like to see someone who is a stable, honest, adult win the nomination, but that seems a vain hope. Dean and Clark are lightweights who think that sneering and floating conspiracy rumours can substitute for policy. Dean's angry child routine has made him into a national joke. Like Clark, Kerry is a rank opportunist who supported the war and who now pretends otherwise in order to appease the Democratic Party's left wing. The only honest and stable Dems left are Edwards, who's still wet behind the ears, and Lieberman, who will never win the nomination. We're looking at four more years of GW Bush. I'm impressed with al of the candidates but I think General Clark has the best chance of defeating Bush!! The New Hampshire Primary should be won by any solid candidate who will tackle Bush and the Republicans on all pressing issues from Iraq to domestic policy and the economy. It doesn't really matter who wins, as long as the winner can stay consistent and defeat Bush in the Presidential Elections in November and restore sensibility and credibility to the office. The media prematurely sided with Dean and focused most of their attention on his campaign. As the Iowa causes grew closer, more people were able to find out more about the other candidates and their views. I've followed the campaign closely and know that Kerry is the best fit for President. He has the knowledge and experience to remove W.
While it is true that Kerry has the war-record to fight Bush on foreign policy and Edwards has the ability to carry the South, Clark is undoubtedly the best candidate for the Democrats as he can do both. New Hampshire voters would be wise to cast the most practical vote and give Bush a true fight come November. I just hope the people go out and vote, and actually think about who they are voting for. We need a strong, trustworthy Democrat to take control of this country. Edwards is intelligent, articulate, and focused. I like his position on fiscal and social issues. However, the candidate who challenges Bush will get my vote. The successful contender will have to showcase what should have been obvious in the first race (of 2000), that Bush is a misfit for the Presidency. Kerry has the experience, intelligence, and political savvy to best do that. Of all the candidates John Edwards has been the most consistent on all levels. The others are too much focused on politics and each other. John Edwards seems to be sure of his vision and his goals without being intimidated by the others. He stays positive, he stays sure of himself, and his focus is on the voters and their real needs. That is the kind of candidate that will stand against Bush in the long run. Kerry is the best of the bunch. Dean is a pandering populist, Kucinich is too socialist. Now Joe Lieberman is alright. I can't believe he ever linked up with that idiot Al Gore. And last but not least, Rev. Al, if you can't make up your mind, vote Rev. Al! Kerry is my guess. I like Kocinich, but I want a winning ticket. Kerry has the experience on an international level, which ultimately is what we need I think. The world is too small to keep ourselves mired in provincial, insular attitudes. Then we'll need Edwards Southern supporters to get the ticket into a winning position. Howard Dean should win. He did a great job as governor in Vermont and has the ability to do the same for the country! The best predictor of what a candidate would do if elected is what he/she has done in the past. As governor of Vermont, Howard Dean has already accomplished --albeit on a smaller scale-- what he says he would do as president. For my money what Dean promises is what the US needs: in fiscal policy, health care, education, international relations, and national security, Dean "gets it". Anyone but Howard Dean! I don't like how Dean panders to the "Christian Left," as if by throwing around "Job" a lot, he can win over the non-conservative church-goers. I'd prefer an honest atheist candidate than this hot-headed chameleon. New Hampshire has been known to be a maverick state of voting a candidate completely the opposite of Iowa. If that's the case, I would say the vote would go towards Clark or Dean. 11 Out of the last 13 primaries, the New Hampshire winner has gone on to be the Democratic Party candidate. I personally am supporting Dean because of he was the first candidate who has been consistent in his message against the war in Iraq. Everyone seems to forget that he was a very good fiscal conservative while governor of Vermont while creating the best social justice for women and minorities. Clark is the only candidate that has enough broad appeal to beat Bush. The others seem like nice enough people but are just 'business as usual' democrats. Clark is the best choice for a strong leader to restore this country to proper stature on the world stage. My heart is with Kucinich, but I'll be casting my vote for Dean because I think he is liberal enough to motivate the party base and young voters, but not so far left as to alienate the centre and become unelectable. To compete with Bush, a candidate must come across as trustworthy, charming, folksy, intelligent and optimistic. John Edwards is the only man who can really do this. As soon as he gets enough publicity, people will catch on that he is the one. Edwards. He's Clinton without the ethical baggage. An articulate, well-spoken Southerner, he poses the greatest threat to Bush. An Edwards-Clark ticket would combine compassion with intellectual savvy, and give the Democratic party an excellent shot at regaining the White House. When I vote in primaries it will be for Dennis Kucinich, because he is a true human being! I used to be a Deaniac until a friend showed me Kucinich's platform. He truly represents the tenets of the Democratic Party both in word and in deed! Kucinich is already my president - the rest of the world just doesn't know it yet. Personally I can see Kerry taking New Hampshire, followed by Clark and then Edwards, but in the long haul I feel that Edwards will easily take the south. And when Clark drops out of the race for President, an Edwards ticket will give Bush a run for his money. Either of the two Johns; Kerry or Edwards, should win. Actually they should strike a deal: If any one of them ends up winning the nomination, the other should be running mate. Kerry needs Edwards to carry the South, and Edwards needs Kerry for his foreign policy experience and military credentials. Kerry will win New Hampshire, but Edwards will win the nomination. Once the campaign goes South, Kerry will be only a memory. The candidate that should win should be the one with the strongest probability of resoundingly defeating Bush. If security is the issue then Clarke or Kerry, social issues Dean or Edwards. Unfortunately there is no real all-rounder. Lieberman appears to be carrying baggage from 2000 and is not my choice. From reports it sounds like Edwards will win, however I have my doubts that he is a sufficient all round political heavyweight. Whoever the candidates are, they should be required to be given a lie detector test during the debates. If they are honest no one should have any problem with that, from whatever party he is from. As a worker, I am required to take drug test, why are they not required to do the drug test and lie detector. After, all national and world security and peace is at stake. Edwards - I can see a little of Kennedy, Carter and Clinton in him. Kerry will win. (He is Senator in the next state south and the Massachusetts Diaspora here will elect him.) Clark second. Lieberman third. Edwards fourth. Anyone would be better than Bush! But the Democrats are a sorry lot. It has become clear that really good people don't run for president anymore. It is sad that the Democratic Party couldn't find a single strong candidate to run against President Bush. Every one of these men is in one way or another seriously flawed and none of them are qualified for the Office of President of the United States. JOHN KERRY!!! Natural born leader! President Bush will be the biggest winner this week. All of the front runners in the leftist Democratic party are too extreme left for this country. The only one who doesn't sound like a god-hating socialist is Lieberman, but the deal-makers in the party won't let him get even close. My guess is that after next years election; Bush will be president and the Republicans will pick up even more seats in the house and senate. Who poses biggest threat to Bush?